Something missing? We’ve tried to summarize all the features we think you’ll be most interested in but if there’s something missing please Contact Us. Q. Hey, I’m confused! From the feature list it looks like FileLocator Lite and Agent Ransack are the same product, is that right? A. Yep, apart from the name they’re both ‘lite’ versions of FileLocator Pro. Honestly, it’s the same code. During the build process an automated script runs that locates all the Agent Ransack branding and replaces it with FileLocator Lite branding and then recompiles. The name FileLocator Lite simply reinforces the link to FileLocator Pro and is more acceptable for some customers who feel uncomfortable installing a product called “Agent Ransack” at work. Bug fix: Occasional crash with index search and Reports Tab. Bug fix: Occasional crash with large searches left running in background. Bug fix: Issue exporting result list with .NET run-time engine. Bug fix: Indexer incorrectly including additional files. Bug fix: Lite version not reading Office documents properly. Bug fix: Searching standalone MSG files with lots of attachments issue. Bug fix: Lite registration code verification issue. Bug fix: Unable to re-import some MSG files exported from Outlook. New ‘Imply boundary marker’ DOS expression option to control searching when extension specified. Bug fix: Short-cut handling issues. Bug fix: Email attachment naming issue. Bug fix: Include file/folder name in content search settings not working properly. Bug fix: Searching of both message body and attachments not working with stand-alone .eml and .msg files. File short-cut searching now defaults to OFF (speeds up search times). Bug fix: Preview not working with .eml and .msg files. Reducing load times on workspace files. Bug fix: Temp files not deleting until app closed. Bug fix: Short-cut link searching issues. Bug fix: Files disappearing from list after context menu operation. Bug fix: Invalid ‘Update required’ message for updated indexes. Bug fix: Issue searching archives within .lnk short-cuts. Bug fix: Issue with adding new index when default folder read-only. Bug fix: Erroneous ‘Empty file’ warnings. Bug fix: Localization for FR and DE incorrectly sets up Program Files and Windows default search filters. Bug fix: ZIP files date/time fix (again). Bug fix: Warning when very long lines have been split. Bug fix: Overwriting favourites error message fixed. Bug fix: FR, DE language issues. Bug fix: ZIP files date/time DST fix. Bug fix: Fortran highlighting issue. Bug fix: Open favorite in new tab now working. Bug fix: Some 3rd party editors,eg. Sublime, could not handle long path format, now defaults to standard format. Bug fix: Secondary searches in Text tab highlighting issue. Bug fix: Improved memory management on large criteria searches. Bug fix: Installation issue with 2740. Bug fix: Look In expressions not working with UNC paths. Bug fix: Unresponsive UI when network path resolution is slow. Bug fix: German translation issue affecting Boolean expressions. Bug fix: Thumbnails and file icons not loading properly. Bug fix: Multi-line regex failing on very long lines. Bug fix: FR, DE language file improvements. Bug fix: Error message if remember sort switched off. Bug fix: Column settings not saving properly. Columns can be switched on/off and more column options added. Multi-threaded indexing for faster indexing. Index search improved handling of underscores and hypens. HTML Reports export keywords in colour. Bug fix: Criteria window resizing issue. Bug fix: Match case not working properly with indexes. Bug fix: Location field drawing issues. Bug fix: Indexing now supports NOT NEAR. Generate Error Report option added to Index Manager. Bug fix: Context menu icon not appearing on 32-bit apps on 64-bit OS. Bug fix: Truncated data when loading entries from drop downs. Bug fix: Crash with print preview. Bug fix: Language file fixes. Bug fix: Ctrl+F setting preserved during upgrade procedure. Bug fix: Index searched email attachments not showing MSG parent in path. 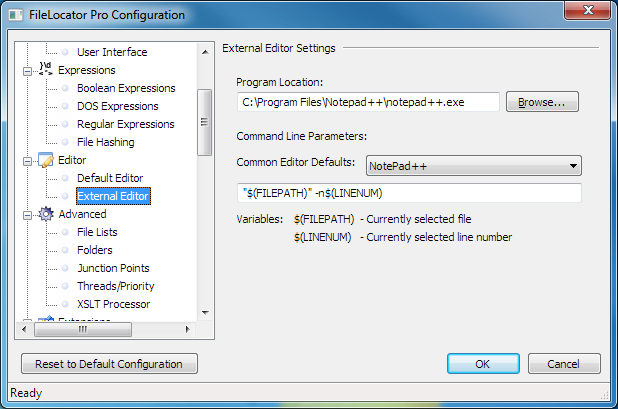 Bug fix: -idxpath command line option ignored if SRF file was also specified. Bug fix: Multi-folder persistent search filter editing issue. Bug fix: File presets not working properly. Bug fix: Alt + Down arrow not working properly on main drop down list boxes. New expression editor to help work with large keyword lists. Command line supports index searching with new -idxname or -idxpath switches. Command line supports index criteria SRF files. Bug fix: Indexer was not correctly reporting out of space errors. Bug fix: Indexer was not properly including non-content files. Digital signatures now using SHA-256. File lists now supported with index searches. File types can now be excluded in indexing setup. Bug fix: Incorrectly showing hits for terms not directly involved in matching line. Bug fix: USB installer now includes API files for all versions of Windows. Bug fix: List view not redrawing properly after deleting files. Option to switch off search-as-you-type in the Text tab. New warning if file does not contain searchable text. Bug fix: Possible crash when filtering large list of items. Bug fix: Index search unable to cancel certain searches. Bug fix: Icons not displaying in drop-down list. Faster list loading for large searches (ie more than 50,000 files). Location filters now applied to root locations not just sub folders. Forward slashes and multiple back slashes in paths normalized. Bug fix: Searching for “*” in Boolean expression now works properly. Bug fix: Very large lines on multi-line regex could cause crash. Bug fix: Search stats on reports not displaying correctly if run from command line. Index sizes significantly reduced (sometimes over 50% smaller). More details added to indexing error messages. Bug fix: Icons not displaying in error list window. Bug fix: Drop downs in Reports Tab failing to open after a resize. Bug fix: French language fixes. Bug fix: Crash when changing criteria type during search. Bug fix: Rare crash when search had finished. Bug fix: Case-sensitive search caused issues when switching to indexed search. Bug fix: Missing icons for portable installation. Support for high DPI settings. Bug fix: Include file name and folder name in content search was not working with PST searches. Bug fix: Would not start on some versions of Windows. Significant memory usage improvements when searching large PST/OST files. Bug fix: Memory leak in PST/OST searching. Bug fix: Copying report to clipboard issue fixed. Bug fix: Launching Explorer failed on some systems. Bug fix: Registration information was not always saving properly. New flpidx command line options for creating indexes. New COM components for searching indexes. Bug fix: flpsearch -ofxlst XSLT processing now works properly. Bug fix: MSG attachments embedded within MSG files can now be indexed. Bug fix: Other small fixes. Bug fix: Issues with single threaded searching through compressed files. Bug fix: Unnecessary memory allocations on large searches. Bug fix: PDF Page numbering issues. Bug fix: PHP Styling issues. Bug fix: Report generating issues with large fields. Bug fix: ‘Invalid Index’ issue with Chinese version of Windows. Bug fix: Possible crash when searching large list of terms. Bug fix: Improved handling of invalid configuration files. Bug fix: PDF text formatting/speed issues. Bug fix: Better handling of non-conformant ZIP files. Bug fix: 7-zip updated to version 16.02. Bug fix: Quoted index searching problem. Bug fix: 7-zip updated to version 16.00 due to vulnerabilities in UDF and HFS handlers. Bug fix: 7z solid archive searching issue. .NET class library and SDK documentation updated for index searching. Option to switch off search-as-you-type index searching. Bug fix: IFilter types now included for Index ‘Documentation’ category. Bug fix: Index can now handle Unicode paths for index store. Bug fix: Issues relating to using .NET library in ASP.NET fixed. Bug fix: Keyword reports for multi-line regex searches now concatenates multi-line matches. Bug fix: Multi-line Regex and Fuzzy search now work with File Lists and missing help dialog resource fixed. Bug fix: Search-as-you-type suppressed if invalid expression entered. Install folder now defaults to previous location. Bug fix: File icons sometimes incorrect when sorted. Bug fix: Bulk Export report not always loading properly. Bug fix: Shell integration issues when using standard user with no elevation privileges. Bug fix: UI sizing issues with MDI mode and mazimized frames. Additional menu options and help information for indexing. Bug fix: Deleting items causing selection issues with other items in list. Bug fix: Sort order now saved/restored with SRF criteria files. Bug fix: Reduced flicker when changing between criteria types. Force empty folder for new index store. Bug fix: Binary file warning notification. Bug fix: Paging issue in hits tab. Bug fix: Allow mixed/upper case registration codes. Bug fix: Use .NET 4 if .NET 2 not installed. Bug fix: DLL issue with Portable version. Bug fix: .NET Core library fixes. (Beta) Console app for command line searches. Bug fix: Background color made more consistent across different tabs. Bug fix: Boolean ? wildcard not working when used mid-word on last word on line. Bug fix: Exported .MSG files can now be re-imported into Outlook. Bug fix: GDI handle usage. Bug fix: Email size now includes size of any attachments. Bug fix: ‘Text Search’ search was behaving like ‘Deep Search’ if raw data search was checked. Bug fix: Date/times now handle DST properly. Bug fix: Missing icons in portable build. Bug fix: Summary report error message. Bug fix: Multi-folder button not working on Persistent Filters. Bug fix: Crash when clearing all search locations in multi-folder dialog and then clicking OK.
Bug fix: Crash when file type column is shown before file name column. Bug fix: Saving favorites on network folders using UNC paths not working. Bug fix: Copying error list to clipboard issue. Bug fix: Occassional crash when viewing file while search still running. Bug fix: Cache module could crash under edge case scenarios. Bug fix: Options not remembered if Load Last Search was switched off. Native .msg file exporting for PST and MSG email searches. Errors/Warnings information on Summary tab. New license options Technician and Floating. New UTF-8 auto-detect feature for files without BOM. Bug fix: Search within search lists no longer limited on size. Bug fix: NEAR combined with AND and OR sub expressions sometimes failing to return valid results. Bug fix: Searching for ‘<?’ caused infinite search. Bug fix: Font issues after changing display settings. Significant performance improvements for all content searches but especially Boolean and Whole word expression types. 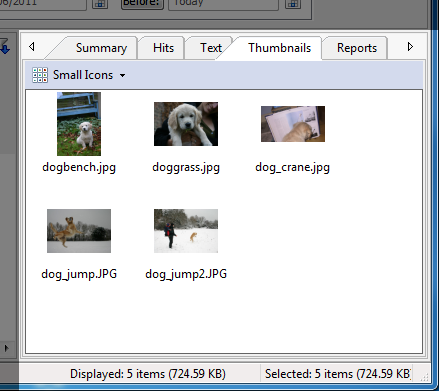 File name truncation options for Contents View and new truncation options for File List View. Containing text script can now work without Containing text value. Double-click divider to size to max column width. Middle mouse button to close tab. Bug fix: Failed search not clearing results properly. Bug fix: Browse for folder not starting from current path. ‘Text Search’ default instead of ‘Deep Search’ for Document Searching. Bug fix: Closing app when minimized causes problems when re-starting. Bug fix: Regular expression error messages not showing properly. MSI installer now accepts LANG_FILE variable to default UI localization language. Bug fix: Highlighting issues with DBCS code page files. Bug fix: COM and .NET component issues. Bug fix: Double-click on PST hits now opens file properly. Bug fix: Help for file name presets was showing ‘Resource unavailable’. NEAR distance configuration can now be lowered to 1. Bug fix: Saving sessions with binary data could cause invalid characters to be exported rendering session file unloadable. Bug fix: Large line truncation bug causing problems loading sessions/workspaces. Audio file searching (MP3, WMA, WAV, OGG and more). Image searching (JPG, PNG, TIF, and BMP). Search time added back to frame. Bug fix: Archive within archive item extraction failure. Bug fix: Loading favourites not clearing previous results. Bug fix: Cache hang issue on large files. Explore Here now highlights selected items in folder. Bug fix: Context menu not working when multiple items in different folders selected. Bug fix: File presets missing from portable install. Bug fix: Switching between ZIP IFilter and composite folder now working. Bug fix: Open criteria bug on Win XP. Bug fix: Session/Workspace loading issue for some regex type searches. Bug fix: Hits tab not automatically selected when files selected. Bug fix: Rename not working properly. Bug fix: Save criteria problem when in Reports tab. Chinese language support (including help file translation). Bug fix: Strict DOS boundary limiting. Bug fix: Open criteria dialog not including *.srf filter. Bug fix: Slow searching and excessive memory consumption with DOC IFilter based searches on very large files. Bug fix: Minor French language changes. Bug fix: Shift drag/drop was copying and not moving files. Bug fix: Right-click drag/drop was not behaving properly. Bug fix: Shift + Del was not working for file deletion. Bug fix: Text based .msg files will now be searched properly. Bug fix: Two user messages not displaying properly. DOS Expression added to list of Look In expression types. Bug fix: Large PST email folders not listing all contents. Bug fix: Corrupted PST email attachments could crash application. Bug fix: Problem copying large number of files from PST/compressed archives fixed. Bug fix: MSI now picks up reg details if run with /quiet switch. Bug fix: Favorites now open sorted by description. Bug fix: External editor ‘question’ missing buttons. Bug fix: FileLocator Pro modal in Shell operations. Bug fix: Update check now reports errors if problems occur. Bug fix: -resetui was not working. Bug fix: Containing text was cutting off text over 1,000 characters. Bug fix: French language update. Bug fix: Some language files missing on portable install version. Bug fix: DOS Expression NOT: now works with File Lists. Bug fix: xpdfrc customization settings now accepted with PDF converting. User interface available in French and German. Real-time memory compacting for large searches. New export format ‘Tab (speadsheet)’. Improved viewing of HTML based PST/MSG messages. Bug fix: Memory management improvements. Bug fix: Improved Unicode searching (especially Chinese characters). Bug fix: Auto-threading and multi-phase search settings not saving properly. Bug fix: Improved threading clean-up code. Attachment information now included in MSG/PST message text. File name word wrapping in Hits tab for non-content searches. Warning if attempt to overwrite Favorite when saving search criteria. Improved memory management if failures occur during search. Bug fix: CSV export was not working if only file name selected. Bug fix: PST (and other composite type) files with very long names could cause crash in thumbnail view or during drag-drop operation. Bug fix: Text tab now opens at correct position in file. Bug fix: Text tab intermittent redrawing issues on x64. Bug fix: Intermittent hanging issue when cancelling archive search. Bug fix: DOS Expression was not conforming to standard. Bug fix: PST attachments now always display long names when available. Improved user feedback when extracting from archives. Locations filters can specify unique expression type. Internal viewer user-defined TAB size. Bug fix: Favourites window now remembers column widths. Bug fix: File list keyboard sync issue. Bug fix: PgUp and PgDwn in Hits View issue. Bug fix: Thumbnail view drag/drop sync issue. Bug fix: Clear History was not clearing all history. Bug fix: Date/time 00:00:00 formatting issue. Bug fix: Text tab was not working with Outlook PST emails or compressed files. Portable installer available to install on USB drives or other locations without requiring Administrator privileges. Bug fix: Containing text field no longer limited to 1024 characters. Bug fix: Column widths can be set much larger and still remembered on re-start. List view synchronized with selection changes in Text tab. Bug fix: Ctrl+A not working properly in Text tab. Bug fix: Changes to Expert user selection were not being saved. Bug fix: Corrupt zip files could cause crash. Bug fix: Internal Viewer secondary search formatting issues. Bug fix: Syntax highlighing issues with some languages (inc. VB, Fortran, RC files). Bug fix: Internal viewer could hang with very large lines. Option to switch off tab taskbar previews (Win 7). Changed internal viewer default to open in new tab (set in Configuration->Default Editor). Improved error checking for invalid XSLT files. Bug fix: Occasional problem with office documents displaying inconsistent results. Bug fix: Locked or invalid office documents causing problem with Text tab. Drag folders to Look In field for searching. Semi-colons accepted for folder names when quoted. Bug fix: Memory leak viewing very large files in Text Tab. Bug fix: File List focus bug when switching between tabs. Shell compatibility with 32-bit apps running on 64-bit Windows. Slight change to default UI scheme. Bug fix: Icons not alway loading properly with WinXP. Bug fix: Labels cut off with higher DPI settings. Bug fix: Check for updates falsely reporting update available. Bug fix: Folder browsing issue with Vista. New ‘Strictly conforming’ option for DOS expressions. Bug fix: Boolean Regex now works with file lists. Bug fix: Delay loading of icons more resilient to badly behaved icon handlers. Delay loading of file icons for improved UI performance. Bug fix: Searching ANSI characters above the 0x7f range now using system locale. Bug fix: Issue with XML export of very large lines fixed. Bug fix: Problem with anti-virus products sometimes locking ZIP extracted files fixed. Bug fix: Problem with searching open Office docs fixed. Drive listing adheres to NoDrives GroupPolicy setting. Outlook searching now supports OST files. Bug fix: Toolbar/Status bar visibility settings now remembered. Bug fix: -ma -mb switches weren’t accepting valid date/time values. 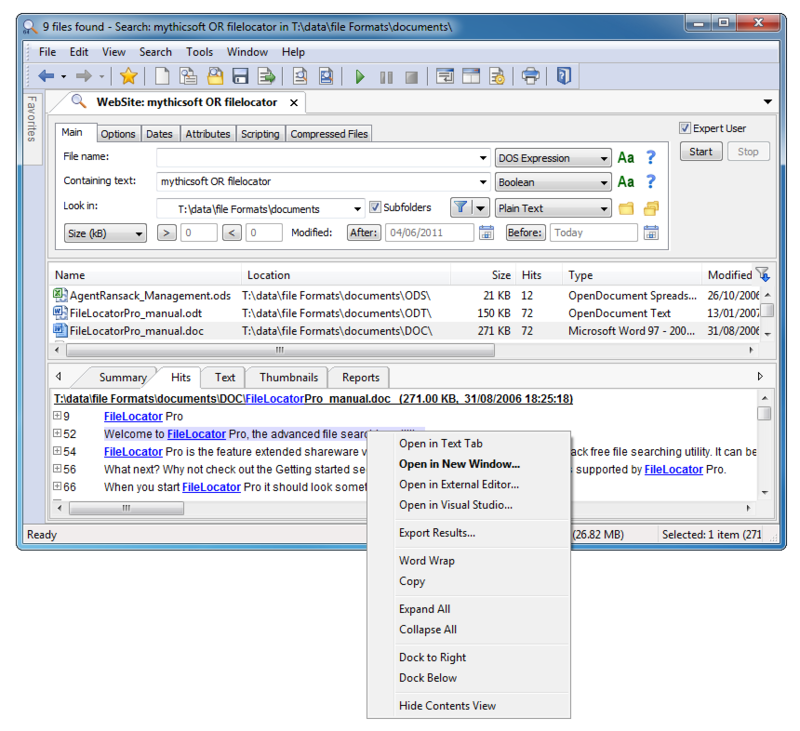 Improved searching for MS Office 2007/2010 files, e.g. DOCX, XLSX etc. New NEAR Boolean operator for proximity searching. New LIKE Boolean operator for matching similar search terms. Improved error messages on expression compilation failures. Improved performance when displaying results for files on network drive. Bug fix: Boolean operator precedence issues. Bug fix: PST searching issue with PST files over 2GB in size. Bug fix: Right-click menu crash when SnagIt installed. New DOS Expression characters < and > to match beginning and end of name. 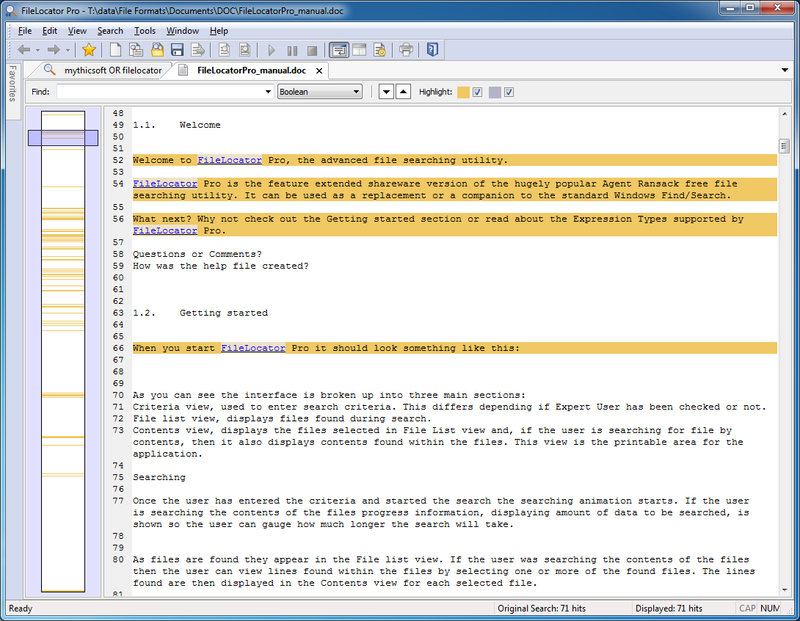 Improved Compressed Doc Interpreter to read extra information, such as VBA macros. Bug fix: Date/time issues if user settings different from system wide settings. Installer has a new USB Drive installation option. Configuration and log file folders now default to a location within AppData for non-USB Drive installations. Bug fix: ‘Required resource was unavailable’ error on expression help. Bug fix: Context menu wasn’t working properly on Vista and Windows 7 with some anti-virus products. Bug fix: Send To menu wasn’t always working with Vista and Windows 7. Bug fix: Window positioning now allows negative coordinates on start-up. Bug Fix: Focus issue with Ctrl + A on file list. Bug fix: Crash in Basic view if search with containing text checked but no text entered. Bug fix: Wizard labels needed resizing. Outlook PST file searching support. Added Create and Last Access date criteria. Bug fix: Toolbar repainting issue. Bug fix: Occasional hanging with Explorer shell extension. Contents view can now be navigated with keyboard. Auto thread configuration on multi-core machines. Sub-expression options moved back to main tab. Check for new version functionality (off by default). New command line option -viewfile to open file in internal viewer. Bug fix: Problem using location filters with zip files at root. Bug fix: Statistics sometimes incorrect. Bug fix: Tab while renaming file issues. Bug fix: Corrupt PDF files causing unwanted message boxes. Speed improvement on single phase searches. Significant memory management improvements on very large searches. Allows UTF8 default format for UTF8 files without BOM. Bug fix: Rename on mouse select wasn’t working. Bug fix: Crash with Nino Copy Path shell extension. Bug fix: Multiple folder dialog added invalid items. New Boolean Sub Expressions functionality [more]. 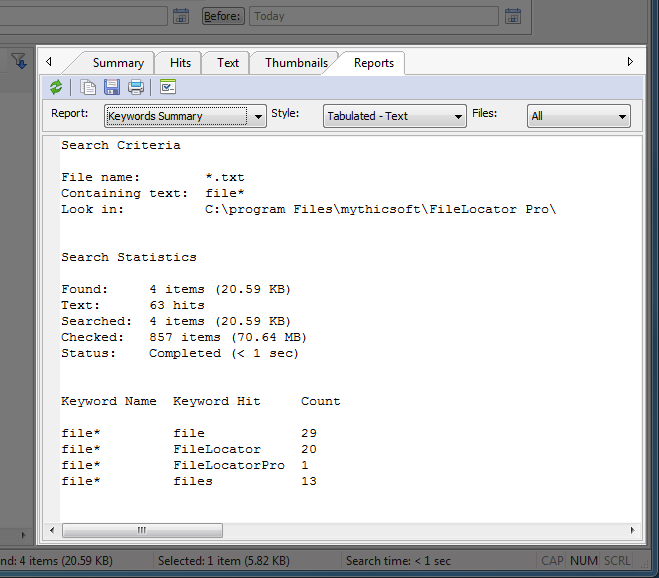 New File Lists functionality for loading keywords from file [more]. Improved native handling of compressed doc formats, e.g. DOCX, XLSX, ODS etc. Drop down list behaviour fixes. Bug fix: Very long lines weren’t drawn. Bug fix: Unicode problems in Zip files. Bug fix: Problems exporting custom format to clipboard. Bug fix: Date/time rounding issues. New Whole Word expression type (Exact Match behaviour reverted to original). Shell ext bitmap transparent sections. Bug fix: Calendar control oversized on Vista. Bug fix: Crash on Tab key in contents view. Bug fix: Crash on Print Preview. New Boolean RegEx hybrid expression type. Exact match limits to whole word only. Improved memory management on very large (TB) searches. Bug fix: IFilter loading issue. Bug fix: -mb command line switch. Bug fix: Crash on very long path names. Bug fix: Rename not working on folders. Bug fix: Containing text check box not working in Basic Search. Bug fix: Date/Time parsing issues. Enhancement: Added resilience for bad/protected compressed files. Bug fix: Crash when opening file in Internal Viewer on a non-content search. 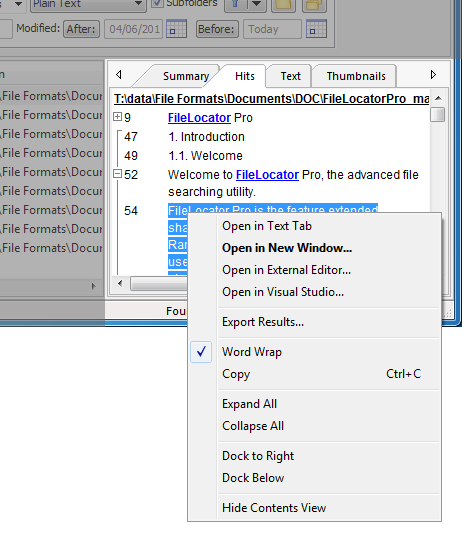 Bug fix: Ctrl+F, F3 Explorer integration now working on Vista. Bug fix: Removed use of boost_interprocess temp folder. Bug fix: Occasional program hang with multi-threaded searches. Bug fix: Crash when right-clicking on thousands of files. Bug fix: Scroll wheel not working on contents view. Bug fix: Vista privilege escalation issue with Shell Integration options. Reverted to older ComCtl version, due to problems selecting multiple files with the mouse. Bug fix: Text sometimes clipped when using ClearType. 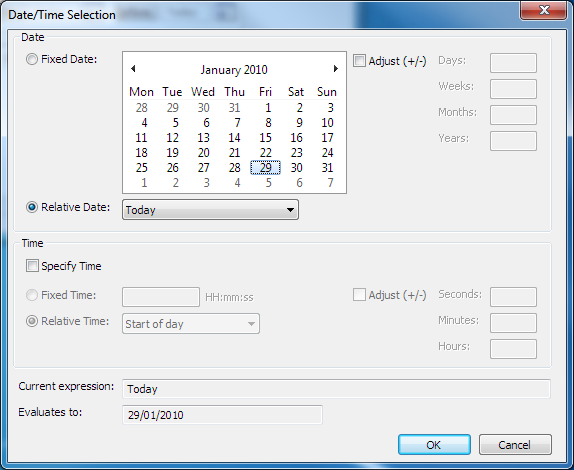 Enhancement: Extra space for date time fields. Bug fix: Floppy drive constantly spinning issue. BugFix: Some IFilters not found due to alternative registration (inc. WordPerfect). BugFix: Search within search not clearing file list. BugFix: Copy Path not putting files in correct sort order. BugFix: HotKey monitor crashes on Vista. BugFix: Invalid reg code crashes application. BugFix: Redraw issues when moving or resizing columns in FileList View. BugFix: Search Criteria dialogs not opening correctly if location invalid. Moved to an updated version of C++ compiler and framework. XML and HTML output now in UTF-8 format. Optimized -o searches for -ocn flag. Agressive memory management with -o searches to improve searching of very large drives. User configurable maximum lines per file (defaults to 10,000). BugFix: Locked files appearing but not searched. BugFix: -pc flag not working on -o searches. BugFix: Multiple threads on -o searches corrupting output. BugFix: CPIO, DEB, GZ extensions. BugFix: Excluding file names in LookIn edit box. Changes for new 5 year reg codes. BugFix: Unable to handle IFilters that have registry information marked as Read-only. Boolean search spanning whole file (not just line by line). Search within search (limits search to files found in previous search). Attribute searching (e.g. Folder, Hidden, Read-only etc). User configurable Alerts/Notifications when files found and/or search finishes. Much better user configuration dialogs. User configuration moved out of registry to XML files. XSL Transform support for saving results in user configurable format (requires Win XP or MS XML Core Services). Dual/Quad core optimizations (user-configurable number of search threads). Perl style regular expressions (Boost library) 2x faster. ‘Look in’ expression handling improvements. Shell context menu improvements including ‘Send To’ and ‘Open With’ bug fixes. Shell extension can launch search on specific files instead of whole folder. ‘Look in’ now accepts paths of individual files not just folders. Title bar displays search progress during search. Log file rotations (stops log files from exceeding 100k). -r command line option to start search immediately. -dw command line option to search current working directory. Extensions can now be run in Safe Mode to prevent them crashing main application. Tab order optimization, with option to restore to standard Left-Right order. Context menu handling handles badly behaved entries better. Zip functionality within WinXP speed fix. Results output double spacing lines fix. Installation now forces overwrite of prior install. Full row select on file list. Tool tip completion if file information not completely displayed. Auto complete on folder drop down. Log files written to logs sub folder. Fixed time not remembered in Advanced tab bug. Installation now no longer overwrites history. Convert 8 bit chars to 7 bit chars option added. Contents resync problem following file delete. Internal viewer not loading files correctly. Problem with badly formed ZIP files. Escaping special characters when regexp NOT used in containing text. Multi-threaded synchronization issues in progress notification code. PDF searching not working on certain long name locations. ‘Look in’ combo only retrieving 260 chars of previous searches. Command line loading of search parms with -o switch problem. Password protected ZIP entries causing problems. Last search DOS Expression not retained correctly after reload. Error if found expression exceeds 5,000 characters. VGA (1024×768) or higher resolution monitor with 256 colors. 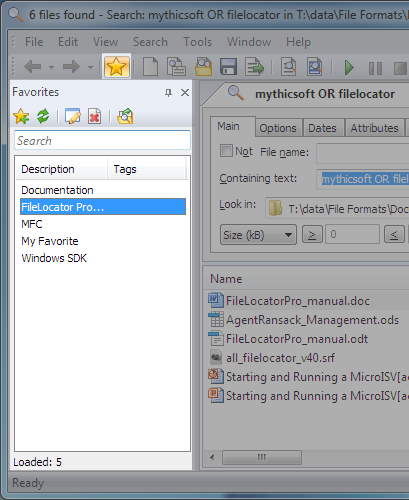 .NET: FileLocator Pro includes a new .NET library Mythicsoft.Search.Core.dll, which is very similar to the COM based library. This is our recommended way to integrate the FileLocator Pro search engine into your application. If you do not want to purchase a full FileLocator Pro license for each user we also offer a lower-priced run-time license option. It is also possible to extend FileLocator Pro’s format reading architecture. If you would like free technical information on writing extensions, including detailed interface descriptions, please contact Technical Support.